Early bird registration ends on April 15, after which the price to attend the pre-conference workshops and conference proper will increase. Mary Lessman will teach Colours from Nature - how to dye yarn using natural dye stuff. These workshops are focused on exploration of a technique that may be new to the student and provide the basics to continue later, or just understand the complexity of the materials. The Colours from Nature workshop can be taken by anyone who works with fibre or yarn - felters, spinners, stitchers, knitters, weavers. The focus is on the dyeing of colours to be found in nature. While natural dyes have gotten a reputation as being beige and bland, you can clearly coax much brighter and colourful hues from natural/plant materials. Maureen Faulkner will bring information on and exercises to help understand the principles of design. These principles are general, not specific to textiles, but she crochets and weaves and can help textile people understand how these principles apply to the creation of unique textiles. Nuno felting is a fun approach to making light weight felted fabric by starting with a silk fabric base. Nuno felting can be used for airy scarves and shawls as well as heavier textiles. Laurie Stefler will guide students through the process. 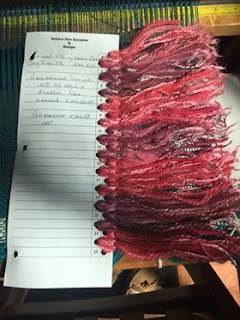 Shibori is the term for a resist dyeing technique. Students will learn how to stitch the motif on cloth, then how to manipulate the cloth so that once it comes out of the dye bath a design emerges. Bernadette Thompson will share the process of making the design in the cloth and how to dye it. 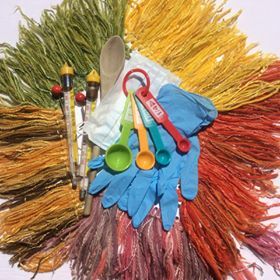 You don't have to be a spinner or weaver to take any of these workshops so even if you are just thinking about getting involved in the fibre arts, or have been intrigued by how design is made in yarn or cloth, any of these workshops could be a fun introduction to working with textiles as a creative expression. For the conference proper ($395), there is a mix of specific techniques and general overall look at textiles. Some leaders will share history of the use of yarn and cloth, some will put that information into cultural context (such as Dr. Susan Pavel's presentation on Salish textiles). Some seminars are quite specific and intended for more experienced practitioners. The instructors range from those who are internationally known in the textile craft field, some are known more locally. 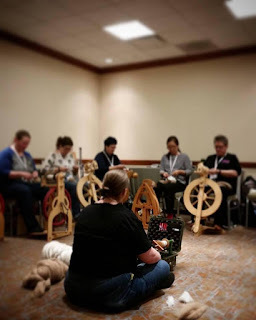 Primarily a conference such as the ANWG events are meant to explore the highways and byways of working with textiles, encourage learning and discussion, spark creativity. They are an opportunity to perhaps go somewhere people have never been before, expand horizons, make connections with like minded people. Right now Americans get a 25% (approximately) discount on prices as they are all stated in Canadian dollars. ANWG conferences are smaller events than the really huge events like Convergence and there is more chance of meeting up with someone met only on the internet or through their publications. 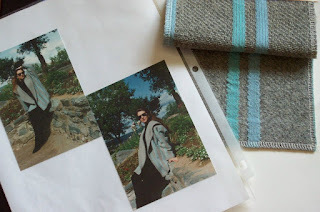 To see - and in some cases - touch the textiles seen only in photos. Above all, a conference is meant to be an adventure, a meeting of minds, a chance to grow. Guilds have been extremely generous in sponsoring awards for the exhibits. To enter go to the conference website and fill out the entry forms. The deadline for exhibit entries is April 15 and to be eligible for an award people must be registered for the conference. Entry for the fashion show is April 15 and the maker must either model the garment or provide a model. The fashion show will be a modified 'tea room' with commentary and when the 'runway' portion is done models will be able to circulate with attendees and answer questions. The campus is small - three blocks by three blocks so there are no long treks across large swathes of geography. All the buildings are accessible. Class sizes are small. Check out the workshop and seminars that are being offered, arrange to meet up with people you may have never met in real life, or get a group of friends and have a fibre adventure. All events are listed on the conference website, make your choice, click on the blue Register here button, click on the green Tickets button, open your cart and drop down menus will let you make your selections, then make your room reservations at the Coast Inn of the North or the Courtyard Marriott and put June 12-15 on your calendar. As they say in Newfoundland - it's gonna be a time!